Happy weekend! It’s been a while since I’ve done a Friday I’m in Love post; I feel like the last couple months have been extra crazy and I’ve barely had time to even be in the kitchen aside from cooking dinners at the end of long days. But now we’ve arrived to a glorious long weekend (Patriots’ Day in Massachusetts!) and the weather may even reach 70 degrees on Monday. Does it get any better than that? So, without further ado, here are a few things that are making me happy right now. Season 2 of Unbreakable Kimmy Schmidt is on Netflix today! I’m trying to decide how I want to watch it… Fall into a television coma this weekend or savor it over a few weeks. If you don’t watch Kimmy Schmidt, you should! Yes, it’s a totally silly show in many ways, but in a super fun and hilarious way. Plus, Jane Krakowski is everything. (I feel like my raccoon shoes look super spiffy on it). 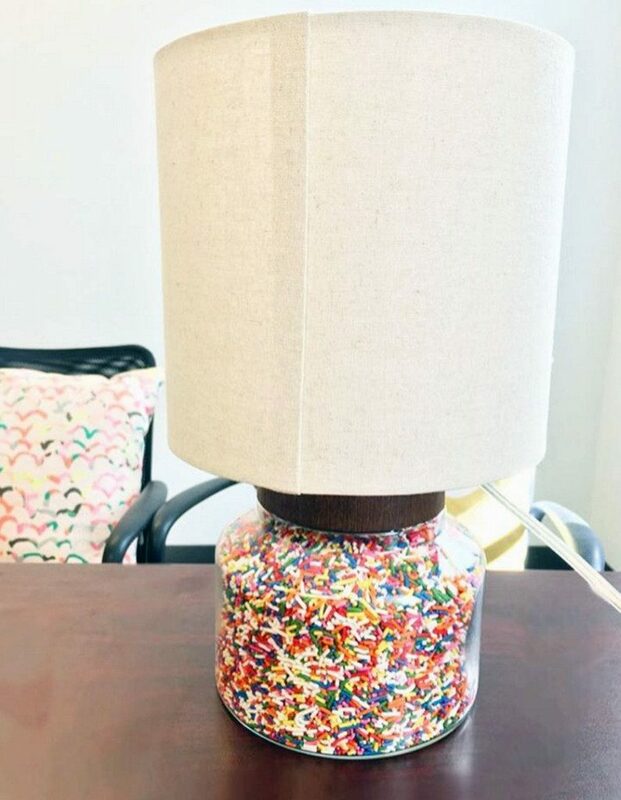 I also got a fillable lamp at target and filled it with sprinkles! Yes, this is about 3 pounds of sprinkles (I bought a 7 pound container on Amazon). A little bit ridiculous, but it makes me so, so happy. I also just hung this tassel garland that I got from the ModernVintagePaperie Etsy shop. It adds such brightness to my office. My fun decor combined with the sun I get from my windows help make work a much happier place to be! I’ve been hearing lots about maple water recently and how it’s all the rage. Well, I only just recently got over my coconut water obsession, so I was resisting it. 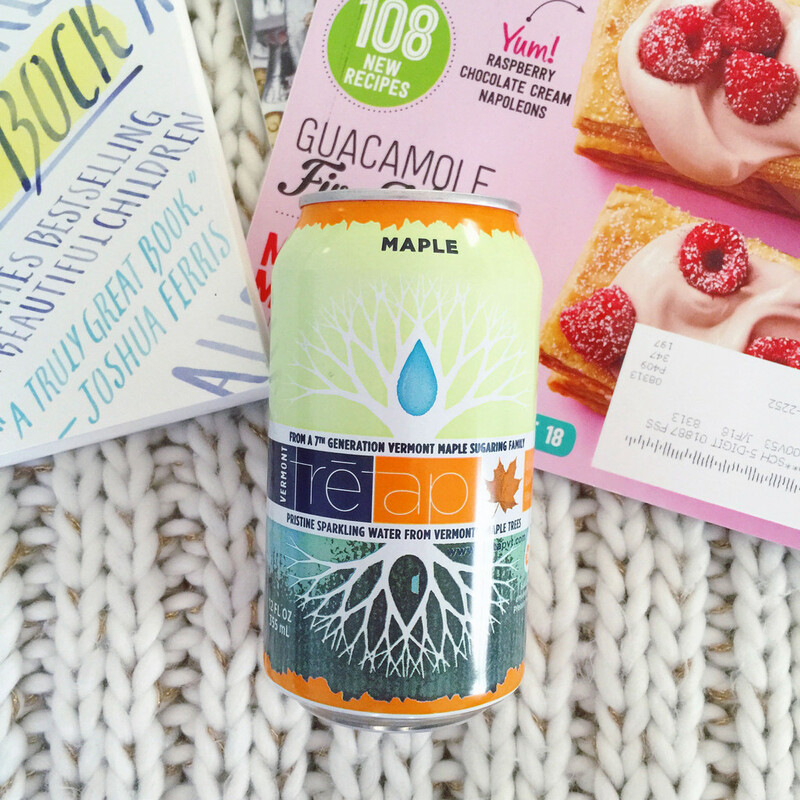 But then I spotted TreTap’s sparkling maple water in my grocery store last week. And I bought it. It’s maple water with Vermont maple syrup infused, as well. 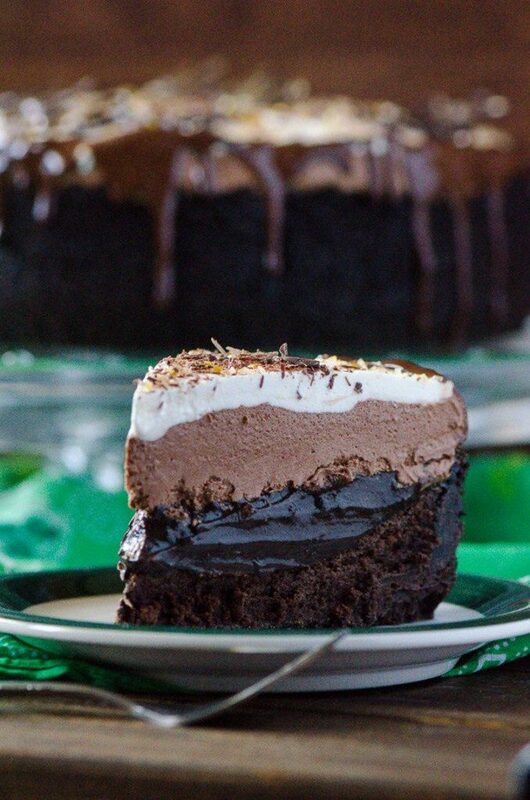 It’s sparkling and doesn’t have any calories and it’s deliciously amazing. It is a little pricey… And part of my reason for quitting coconut water was the expense, but that doesn’t mean I can’t have a little treat now and then. I’ve been indulging in some delicious weeknight dinners lately (part of my New Year’s resolution). 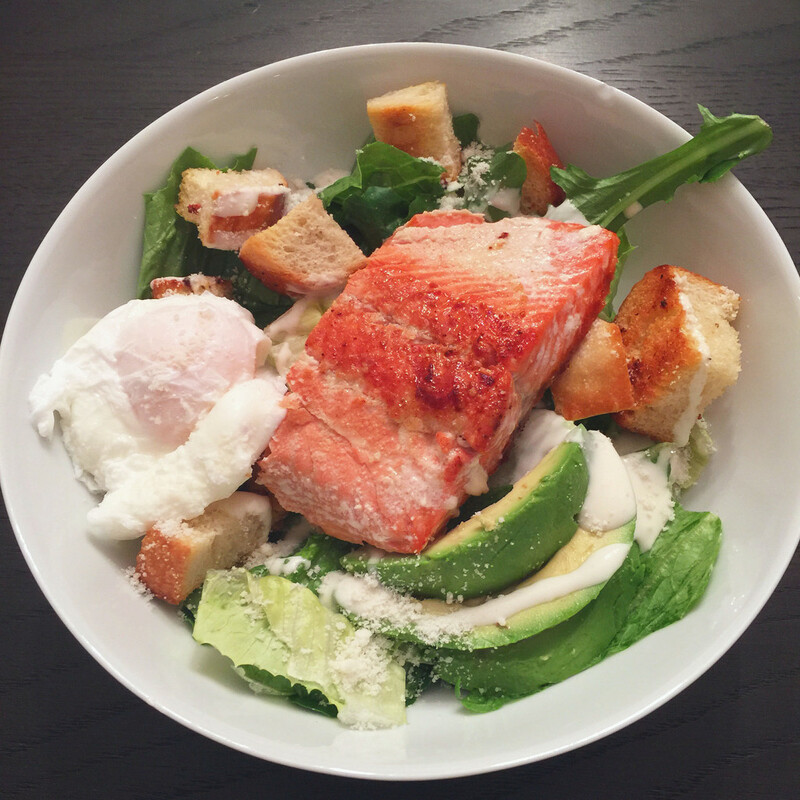 Some standouts include this Caesar salad topped with salmon AND a poached egg (plus avocado and homemade croutons, of course). 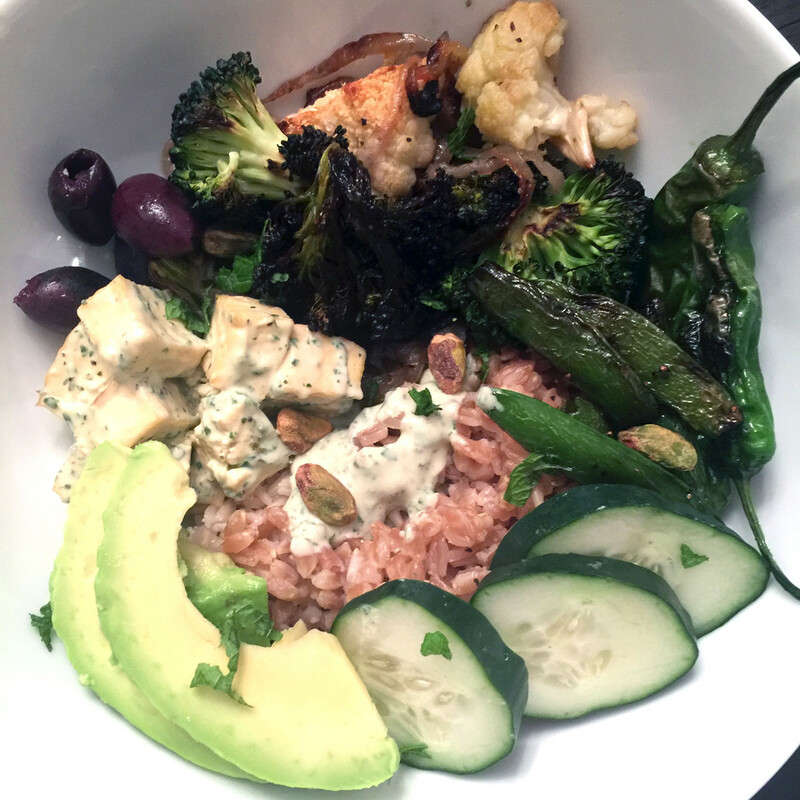 I also made my own version of Well Plated’s Buddha Bowls with roasted vegetables, shishito peppers, quinoa, farro, tofu, an awesome mint tahini dressing, and more. 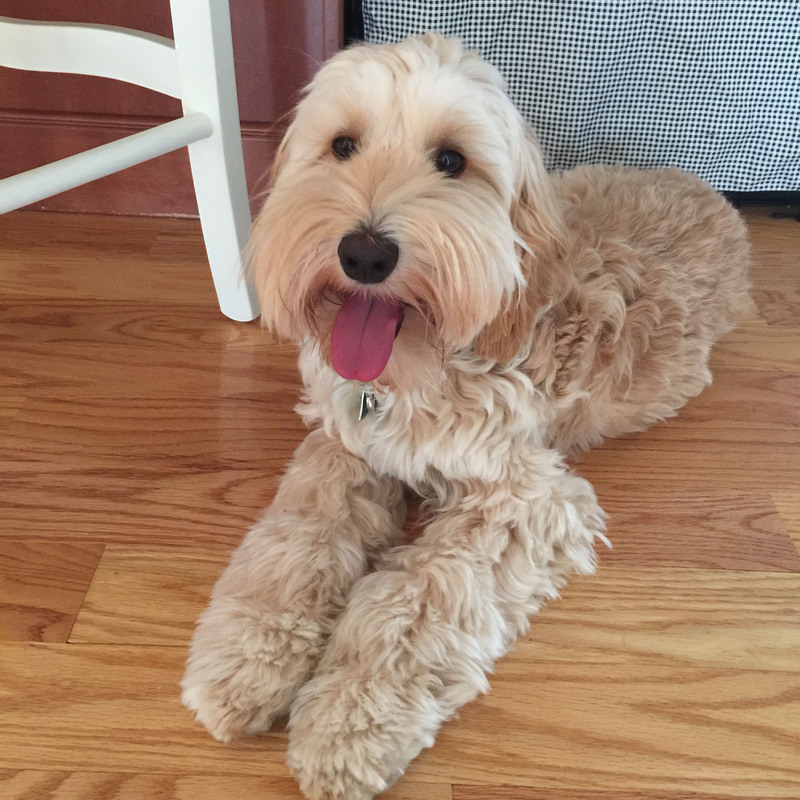 I can’t really do a Friday I’m in Love post without sharing at least one photo of my dog… So, here you go! Here she is exhausted after playing ball (which is more like “keep away” from me). Mitzi’s also in town right now and they’ve been hanging out with Chris while he works. He sent me this picture while I was at work and it made me laugh. Everybody’s just chillin’. Big congratulations to Winnie for graduating her basic manners class. Well, I think everyone graduates. Winnie still has some work to do on her manners. 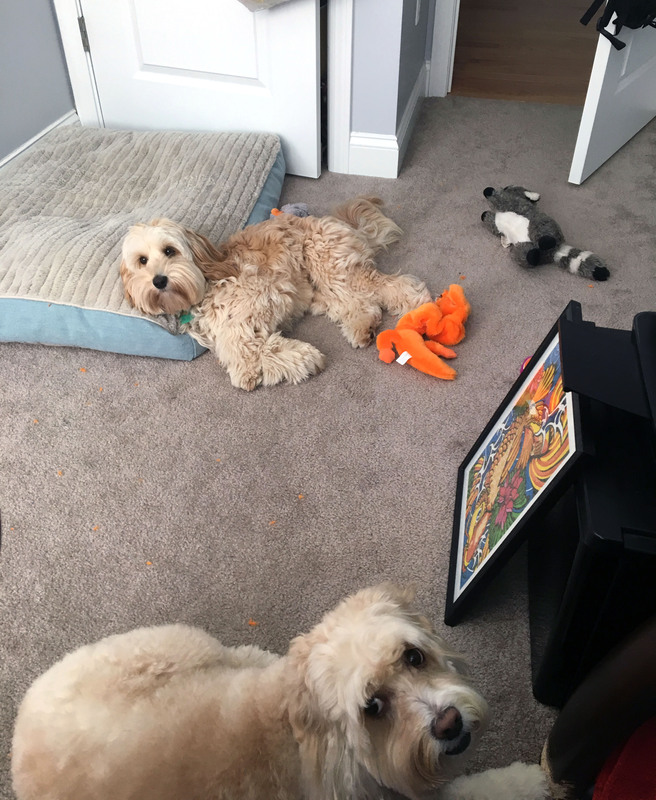 Her anxiety is out of control, which means she cries and barks at everything (even a box in the kitchen that wasn’t there before). Hoping to curb that in a major way as we’re able to get her out more and more this spring summer. 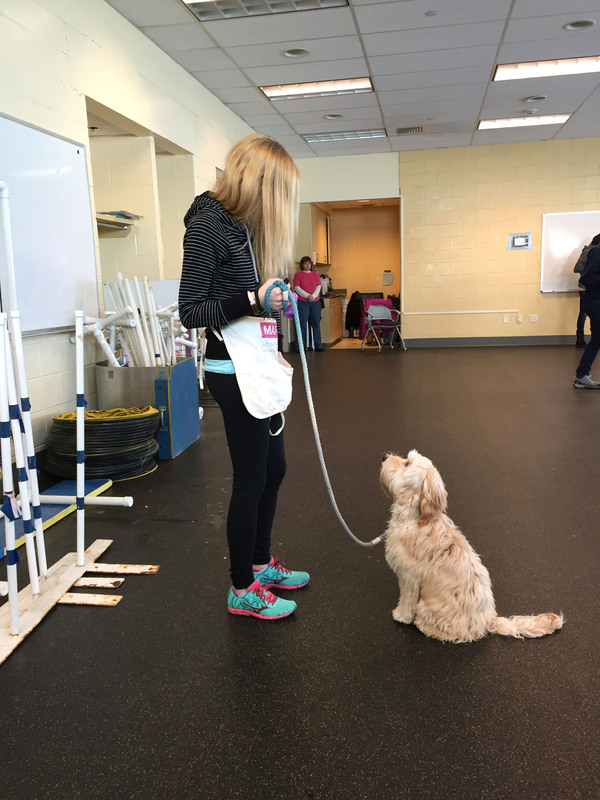 The classes we took at the MSPCA were really good and I think we need to put her in even more new situations to get her comfortable. 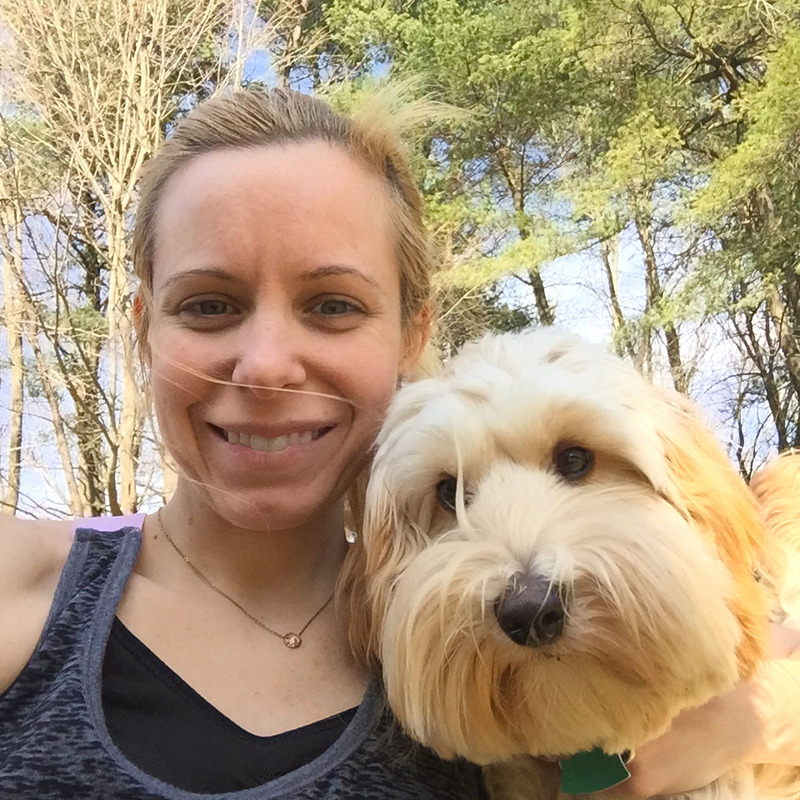 And a Winnie and mom selfie! On one of the rare warm days where not only do I not need a winter coat, but I’m comfy outside in a tank top! Hopefully lots more of these to come. Wegmans Beat Trader Joe’s as the best Grocery Store in America: I 100% agree and am so thrilled that we have Wegmans in New England and one less than 15 minutes from my house. The Weird Future of Movie Theater Food: I so rarely go to the movies, but am really intrigued by all these snacks coming out. And now I’m seriously craving movie theater popcorn with extra butter. Why Kids Should Use Their Fingers in Math Class: Sorry, but this just really makes me feel better about my life. Feeling Like an Impostor is Not a Syndrome: It’s totally normal. My favorite line of the article is, “maybe we should stop calling people who experience impostor syndrome ‘people who experience impostor syndrome’ and start calling people who don’t experience impostor syndrome “’overconfident weirdos. '” Good call! So much booze. So much deliciousness. And so, so pretty. This would be dangerous for me. Like, seriously? Are these not the prettiest things you’ve ever seen in your life? I don’t even want to eat them; I just want to stare at them. But OK, I do want to eat them, too. 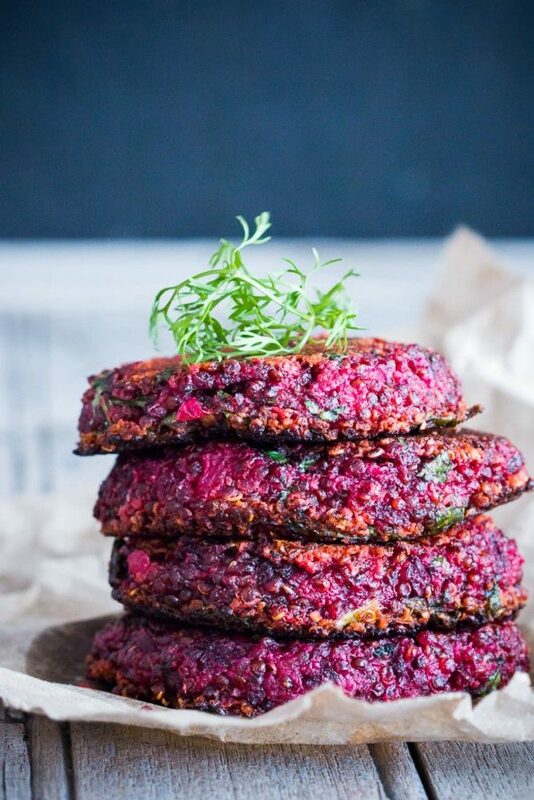 The prettiest quinoa patties ever. And potentially the most delicious, too. Do I need a holiday excuse to make this or can I just make it now? And eat the entire thing myself? And that does it! I’m off to enjoy my weekend, which will consist of a little time in the kitchen, a little time working, a little time with friends, a little time outside, and a little time with babies. It doesn’t get much better than that! 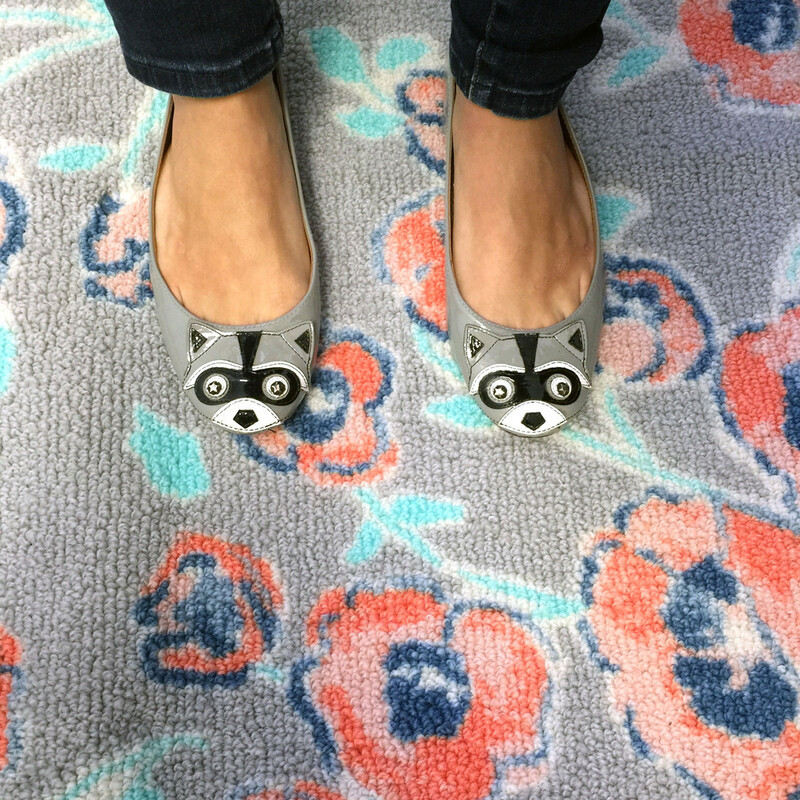 8 Responses to "Friday I’m in Love #8: Pretty Office Decor"
LOVE your racoon shoes!!! I want a pair. Stat! And congrats on the new office digs, lady! An office with windows is almost as exciting as a lamp filled with sprinkles. Almost. 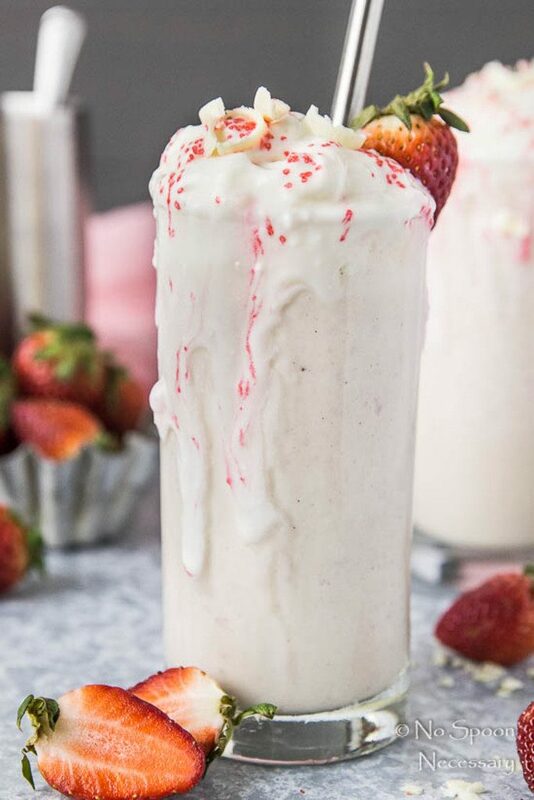 😉 Thanks so much for including my boozy milkshake in the links! Happy weekend, doll! I too love everything that you posted. Love the rug and raccoon shoes – adorable!! I have a sewing room and you inspired me to get one of those lamps to fill with buttons. Thanks for the idea! 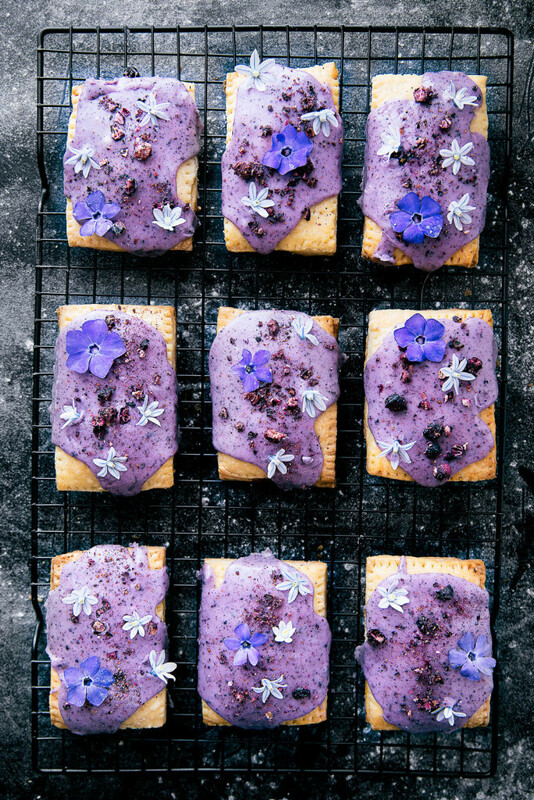 Love the purple pop tarts too :)!! I LOVE those raccoon shoes. 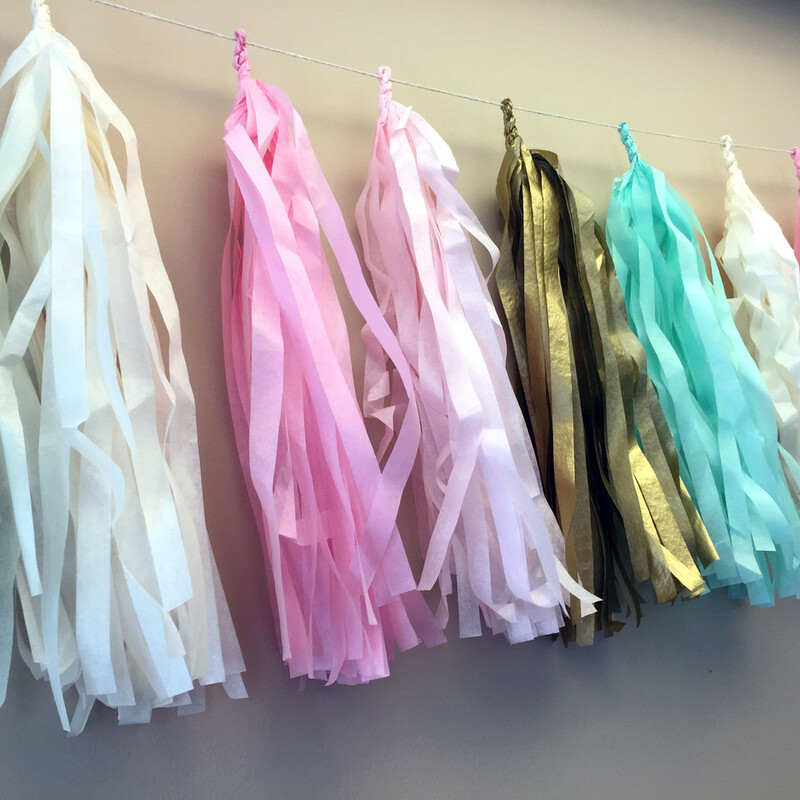 And that you decorated your office in such a fun way. Yay for windows and sunlight! LOVE your raccoon shoes. The lamp is genius and adorable. I am also now craving a white chocolate shake. I love everything about your office! A happy place to be. And your cutie dog of course!